Hey, Thanks for dropping by!! Note that most of this site is slightly antiquated, but I Send a Voice is STILL my newest and only CD - at least until I finally get around to working over all these recordings of lovesongs and lullabyes that I made a couple(?) of years ago - or get over that and move on to some other ground. Meanwhile, there are two more CDs of similar available over at Universal Chanting. AND... I guess I've moved into the current millenium a few steps - here's my first YouTube entry, Dave Carter's great "Any Way I Do," shot on the spur of the moment with a borrowed guitar when I was up in Lynchburg for heavenhelpme my 40th highschool reunion. Furthermore, a chant of mine made it out there under its own power, as a Dance of Universal Peace - two friends (Thanks, Lala and Laurie!!) had put the movements to the "Said Hanuman" chant on I Sent a Voice, having sung it so long at our local Universal Chanting nights that they didn't even know where it came from - and then it traveled around, and got danced and videoed in a cave in Utah. Hey, wait, isn't that a line from "Friend of the Devil"? No, not quite. Anyway, here THAT is! Ah, and while I'm catching up here... I got to be part of the wild saga of BLUEGRASS KIRTAN!, A C Bushnell and Jon Seskevich's great East-West fusion blast, which resulted in a CD which was great fun to sing on - and the experiment continues at various live events... Have a look here for what happens when you mix two rich, deep streams of old-time music from what at first seem like two very different traditions... yeee-hare!! 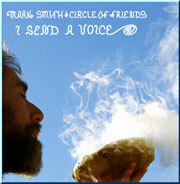 I Send a Voice, is a CD collection of 12 original & traditional CHANTS that spring from devotional chanting that's been happening in North Carolina's Piedmont for the last 20 years and more, sung by circles of friends in living rooms, gazebos, lodges, rallies, fire circles, churches, hospitals, porches - werever the Spirit rises. Click the album cover at right to find out how to listen to samples, download song sheets, and order the CD. If you have enjoyed this Web site, feel free to use the form below to let others know about it. Check it out! Mark Smith has a Web Site!